The best 1.13.2 survival community server! You awake in a strange town, where are you? There are residents running about trading with each other, and a news board in townsquare with upcoming server events. You have a guide in hand that explains how to start your own home here. It's time to write your story. Welcome to Altitude. Altitude is home to players young and old from all around the globe, and here, everyone is family. Altitude is your place to get together with friends and relax - and maybe enjoy some survival too. Altitude is intended for older players, but all are welcome! Altitude is built by the community, for the community. We've added features requested by our members and several custom plugins to create our "perfect" survival experience. Two of the most requested plugins on Altitude, level up yourself and your pet with these MMO-based plugins! See the world and the players around it in real-time! The map shows the entire survival world with claims and towns. Our economy is built on player shops, encouraging player interaction and putting the control in your hands. No matter how busy our lives are we all need a place we can unwind and forget about things for a while. Altitude is your home for just that. We are a simple server, with a focus on having a good time and hanging out with friends. "Great community, great people, great server all round . . . If it can bring back my love for minecraft, it could work wonders for you." 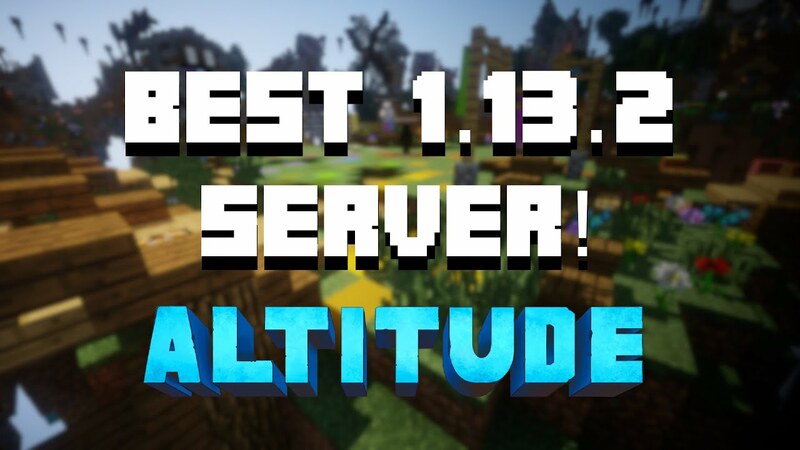 ​Altitude is a community-centered 1.13.2 survival Minecraft server. We're one of those servers you call home and everyone's family. Survival is our focus, with a few features suggested by the community to make things more interesting. Copyright © 2015-2019 Altitude. All rights Reserved. Not affiliated with Mojang.